Building • Director says new prototypes are 20% more energy efficient, use 50% less water. Paul Fraughton | The Salt Lake Tribune. 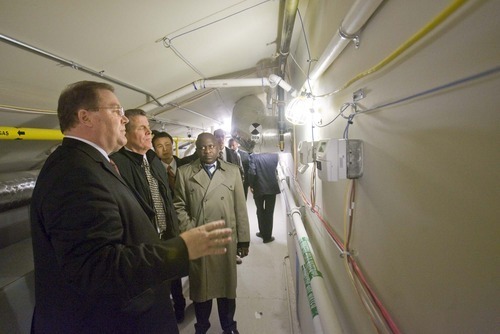 Jared Doxey, the director of architecture, engineering and construction for the LDS Church, recently shows a group of LDS church members the Farmington West Stake Center, which is the church's pilot building for energy efficiency. In the building's mechanical room, he points out the features of one of the furnaces. 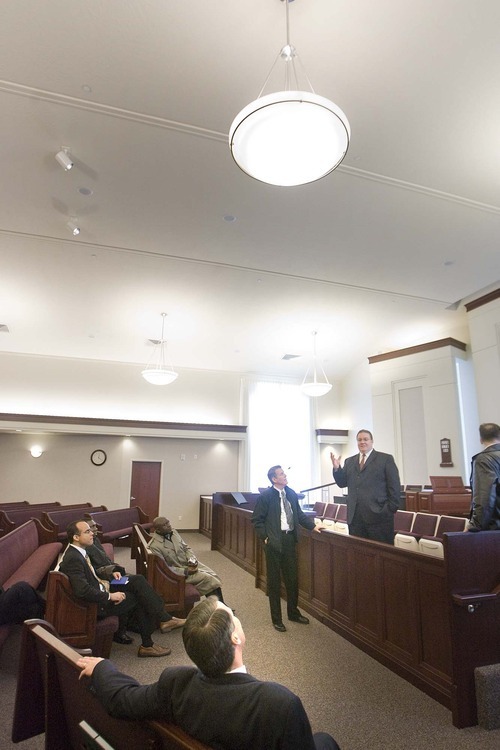 Paul Fraughton | The Salt Lake Tribune Jared Doxey, the director of architecture, engineering and construction for the LDS Church, recently shows a group of LDS church members the Farmington West Stake Center, which is the church's pilot building for energy efficiency. Here he shows the group members, whose callings in the church are related to buildings, the lighting in the main chapel. Paul Fraughton | The Salt Lake Tribune Jared Doxey, director of architecture, engineering and construction for the LDS Church, recently shows a group of LDS church members from around the globe the Farmington West Stake Center, which is the church's pilot building for energy efficiency. 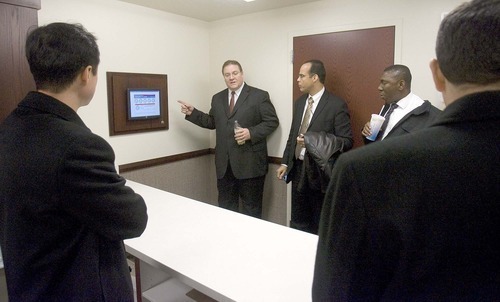 Here he points out a display that shows the amount of energy the building is using in real time. 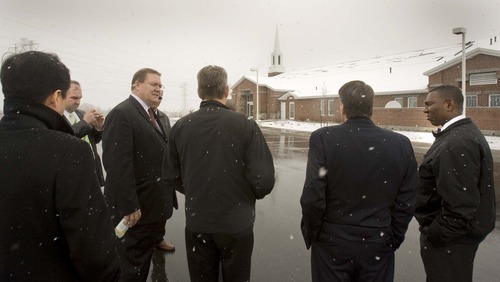 Paul Fraughton | The Salt Lake Tribune Jared Doxey, the director of architecture, engineering and construction for the LDS Church, recently shows a group of LDS church members the Farmington West Stake Center, which is the church's pilot building for energy efficiency. Outside the building on a snowy spring day, Doxey points out the solar panels on the roof. Paul Fraughton | The Salt Lake Tribune Jared Doxey, the director of architecture, engineering and construction for the LDS Church, recently shows a group of LDS church members the Farmington West Stake Center, which is the church's pilot building for energy efficiency. 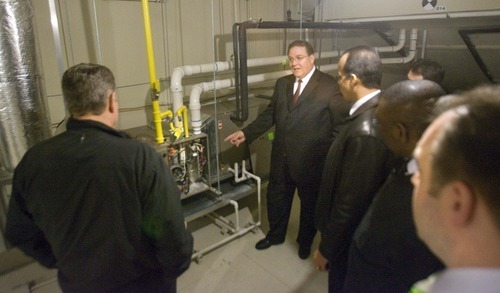 In the building's mechanical room, he points out the building's temperature monitoring controls. 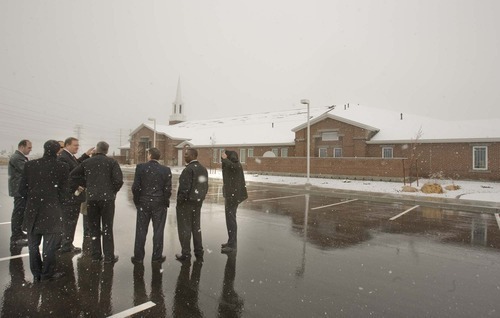 Paul Fraughton | The Salt Lake Tribune Jared Doxey, the director of architecture, engineering and construction for the LDS Church, recently shows a group of LDS church members the Farmington West Stake Center, which is the church's pilot building for energy efficiency. Outside the building, on a snowy spring day, Doxey points out the solar panels on the roof. Lessons learned from pilot "green" meetinghouses, including one in Farmington and one in Eagle Mountain, are being applied in new LDS Church buildings throughout the world, says Jared Doxey, director of architecture, engineering and construction for the church. The Davis County meetinghouse, which houses the Farmington 6th Ward and Farmington Ranches 4th Ward, eventually will be a stake center. It was the first of five prototypes completed last spring and often is used by The Church of Jesus Christ of Latter-day Saints to showcase what Presiding Bishop H. David Burton called an "aspect of our culture [that] has become a vital part of our DNA." Other "green" meetinghouses completed in the past year are in Eagle Mountain in Utah County and in Pahrump, Nev. A fourth is nearly complete on the border of Mesa and Apache Junction in Arizona. A fifth is just being built in Logandale, Nev., between Las Vegas and Mesquite. The differing climates give Doxey and his team the chance to try various insulation, heating, cooling and roofing systems to learn what works best. "All of these new prototypes are about 20 percent more energy efficient and use 50 percent less water inside and out," Doxey said. While some of the systems engineered into the buildings are still being analyzed to prove they are cost effective, others are clear winners that have been added to standard plans for meetinghouses, Doxey says. The Salt Lake City-based church builds more than 200 meetinghouses around the world each year. The proven systems include tankless water heaters, high-efficiency windows and insulation, and carpet glues and wood coatings that are not oil-based, which translates into better interior air quality, Doxey says. "We don't just throw stuff out there and hope it works. We want to prove that it works," he says. "You might pay a little more up front, but you can save over the long run." The new configuration of the chapel, with pews arrayed in a fan shape, has also become standard. That design element is more about space efficiency than energy, Doxey says. "That is probably the best feature on the interior. We've heard nothing but praise for it," he says. It adds 35 more seats and the back pews are nine feet closer to the podium. "That's all a plus." One system still being scrutinized is the high-tech system that estimates the number of people in the building by measuring carbon monoxide and adjusts the fresh-air intake accordingly, Doxey says. The church also wants to assess the solar system after a full year of operation. The building was dedicated last June. The savings from the 158 solar panels so far is a little less than the projected $6,000 per year in electricity costs, but the system is "working flawlessly," he says. "We expect it to work this way for 30 or 40 years." The prototype in Arizona has 18 fewer panels, but the church expects those will supply even more electricity because it's a sunnier location. The Logandale meetinghouse also will be solar-powered. The Farmington building was the second built by the church to the exacting standards of the silver Leadership in Energy and Environmental Design (LEED) certification. It entailed recycling waste material from construction and using recycled materials when possible. In 2009, the church finished its first LEED certified building, the new Church History Library in downtown Salt Lake City. Scott Isaacson, bishop of the Farmington 6th Ward, says that although his congregation loves the new building and its bigger hallways and rooms, the "green" aspects are not obvious. "It feels like most other churches," Isaacson says. "The high-tech aspects are kind of transparent. That's good, I guess. We don't notice." The automated lights and heating and cooling system work well, Isaacson says. "We don't have thermostats to change and we don't have as many complaints about it being too hot or too cold." The church fitted the prototypes with monitors so church members can see at a glance how much energy they are saving and how much the solar panels are producing. That has provided some "teaching moments," as well as his own joke with his ecclesiastical leader, Isaacson says. "I tell the stake president, doesn't that [savings] go into the budget for our ward?"